BBC Radio 5 live's David Law tweeting from Flushing Meadows: "US Open word of the day No.1: 'Patronage'. As in 'Ladies and gentlemen, thank you for your patronage here at the US Open'. Goodnight." 0547: So that's your lot for an epic day one, and it's only a matter of hours until we kick off the day two coverage at 1600 BST. I'm off to bed to make sure I'm fully match sharp for Andy Murray v Ernests Gulbis in the early hours of Wednesday morning. Goodnight/morning. 0545: There we have it, Andy Roddick wraps up a 6-1 6-4 6-2 win over Bjorn Phau and, apart from the second-set blip, it was a pretty impressive start from the 2003 champion. 0537: Roddick earns a ninth break point with a deep return and converts with a blistering cross-court forehand winner. Game over? I think so. 0532: Boom. Roddick holds in double-quick time and he leads by two sets and 3-1. BBC Radio 5 live's David Law tweeting from Flushing Meadows: "Internet went down, but JO and I still in position. Coming soon, our 'American word of the day', as we seek to understand the language." 0525: Roddick's forehand is flowing now and he gets a break at the start of the third set. Meanwhile, Venus Williams is asked what it will take for her knee to recover in time for the second round. "A lot of prayer. It's going to be a lot of prayer. Everything I can throw at it. But, you know, I'm tough." 0519: Well, it wasn't exactly straightforward but Roddick serves out for a 6-1 6-4 lead as the clock ticks past midnight in New York. Fortunately, the city never sleeps. 0512: Roddick makes a Beckeresque dive to play a winning volley as he moves 5-3 clear. "Andeeee... you're my hero!" shout a group of very young sounding girls in unison, which gets a laugh from the crowd. 0507: Roddick is back on track, battling to break point and coming up with a fantastic forehand on the run that he bends around Phau at the net. He leads by a set and 4-3, with a break. 0501: A beautiful cross-court backhand pass takes Phau to 40-30 but he hits a poor forehand on game point and Roddick soon gets the break back. The American is clearly not happy with his earlier slackness, however, and slams his racquet down as he gets to the chair. The doctor then comes on and does something to Roddick's ear, which appears to be bleeding, not sure why. 0447: The second set gets off to an unremarkable start until Roddick chases down a smash and hooks a forehand past Phau at the net, which gets the rather subdued crowd going. Phau then bunts a forehand long for 15-40 but does well to recover and hold for 2-1. 0435: Good stuff from A-Rod, who has already put away a couple of sharp forehand volleys - if only he'd managed that in the Wimbledon final, eh? He breaks again for 5-1 and serves out the set in 25 minutes with his third ace. 0427: Roddick's wife, Brooklyn Decker, a regular tweeter, looks on from the stands as her man moves 4-1 clear. Coach Larry Stefanki sits, arms folded, as though his plan is coming together nicely. Which it is. 0423: Phau gets off the mark and shows the odd flash of a nice one-handed backhand but he still trails 3-1. Roddick takes his towel from a ballboy who must be in his 30s and is several inches taller than the fifth seed. 0416: Roddick breaks for 2-0 and he looks in the mood to get this one done and dusted, sharpish. 0412: Roddick is off to his usual fast start, hitting his first ace of the day to seal the opening game and heading briskly towards the chair. 0403: Here they come, Phau and Roddick enter the arena to a decent hand as Welcome to the Jungle screeches around the 20,000-seat stadium. Phau is a positively geriatric 29 years old, ranked 84th and has lost both previous encounters with Roddick, although the German did get a set off him in Beijing last year. 0359: "Trying to reconnect with my PhD thesis after laziness and have my laptop screen split between my current chapter and the match; with Venus all over the place don't know which is progressing more depressingly." 0357: Come on people, we can do this. One final match remains and it pits world number five and rejuvenated title contender, Andy Roddick, against Germany's Bjorn Phau(!). It's approaching 11pm in New York, which is a silly time to start a tennis match, let's face it. 0344: A scream, a leap and a hurried smash just about seal another game for Venus and she's within sight of the finishing line at 5-3. 0340: Blimey, 500 sheets? I wouldn't be feeling too happy about that after seeing Venus wallop another forehand into the back-stop but she still leads 4-3. 0339: "I have £500 bet today.. last match i'm waiting for.. venus.. supposed to be deep in my sleep.. but reading your messages about her knees and bad serve left me praying all night until now.."
0336: For the love of.... Venus goes walkabout on serve again and slips to 0-40. A wild forehand flies over the baseline and Dushevina is back to 4-2. 0333: Dushevina stops the rot after losing seven straight games but she still looks understandably irked as she heads to the chair trailing 4-1 in the decider. It's 10.30pm local time and Roddick and Phau are still some way off starting their match. Ross Hutchins on Twitter: "It's very easy for Andy to be good at fantasy football when he copies the best managers team! very poor form... copying me gets u nowhere mate." 0324: I think it's safe to say that the enchanting story of Vera Dushevina at Flushing Meadows '09 is about to come to an end. Venus storms through a second break of serve to take total control of the final set at 3-0. 0317: Dushevina double faults on break point and it's not looking good for the Russian now. 0312: "Still here Piers! Why doesn't Venus take some time off and get her knee fixed if its causing her so much trouble? Both Roger and Rafa have spent time off with injuries in the last year so why is she too good to do it? She insults her opponents by continually calling for the trainer and interrupting their rhythm. Fix your knee and see if you can't win some more slams then Venus." 0311: All of a sudden, the Venus serve is in working order. Three hefty deliveries get her to 40-0 and a thumping second serve makes it one set all. I know who my money's on now. Sorry Vera. 0309: Look out - Venus gets to 0-40 and converts her third break point with a wrong-footing backhand winner. Dushevina shakes her head in the manner of someone who is faintly annoyed - she does not appear to be a racquet-smasher, Vera. 0305: Great stuff from Venus, who recovers from 0-15 with some huge forehands and makes it 5-5 with a slam-dunk smash. 0300: Dushevina comes up with a superb overhead winner after bravely attacking the net at 15-30 and she gets her reward by taking the game - one game away from a huge win, and major upset. 0255: Venus just about hangs on from 15-30 after another sizzling backhand winner from Dushevina and it's 4-4. 0252: We're still on serve but Dushevina holds easily to move 4-3 up and just two games from the biggest win of her life. Laura Robson on Twitter: "Retail therapy and manicures make me smile, back to training tomorrow." 0246: Venus comes up with a few heavy groundstrokes in succession for the first time tonight and cuts the deficit to 3-2. This one could go on for a while yet, Roddick and Phau might need to start a sudoku in the locker room. 0242: Double-fault number seven sees Venus slip a break point down and Dushevina soon finds herself a set and 3-1 up. It's a question of nerve now for the Russian. 0233: Venus dumps a smash into the net and it's 1-1. If Dushevina doesn't beat Venus tonight, she never will. BBC Radio 5 live's David Law tweeting from Flushing Meadows: "Venus looks in trouble here. She has always been coy about this knee problem, but her Dad Richard said it had bothered her for six months." 0230: Venus breaks at the start of the second set. Everyone is waiitng for the inevitable comeback but she's really struggled on serve tonight, which is presumably because of the knee. 0224: It's hard going for Venus and the decibel level reflects that but she looks in control at 5-2, only to see her game disintegrate yet again. Foot faults, double faults, wayward forehands.... Dushevina gets to 6-5 and takes her first set point with a superb backhand cross-court pass as Venus attacks the net. Time to dust off the dodgy shock graphic. Ni La, the 18th seed, has beaten Ioana Raluca Olaru 7-6 6-3, and Radek Stepanek has finally seen off Simone Bolelli 6- 6-4 6-4 despite needing a couple of goes to serve it out. 0208: Daniela Hantuchova, seeded 22, has beaten Meghan Shaughnessy 6-2 4-6 6-1, and Venus has been broken again with some more wayward stuff from the baseline. Dushevina will have another go at serving out the set. 0205: Dushevina absolutely creams a backhand down the line to get off to a good start but the nerves grip her at deuce, a desperate double-fault giving Venus the chance to level. She takes it - 5-5. Maria Jose Martinez Sanchez and Sybille Bammer are having a bit of an epic out on Court 10, with a tie-break required to separate them. 0158: Venus is broken again, with two foot-faults not helping her much, but credit must go to Dushevina who is climbing all over the American's second serve, and she will now serve for the set. 0151: "I knew I forgot to put something on that text - my name!" 0150: Talking of noise, Venus is making a fair old racket at the moment as she saves a break point to move 4-3 up on Dushevina. The American then gets more attention to her knee. Hantuchova has a break at the start of the final set against Shaughnessy. 0147: "I knew that she was very loud. Noise wasn't the problem. If you're looking at that, you can't play. I was more focused on me. Maybe too much." 0137: Ni La, the 18th seed, is having a right old battle on Court 11 but edges the first set in a tie-break against Olaru, while Shaughnessy levels up at one set all against Hantuchova. And Venus breaks back for 2-2 against Dushevina, much to the locals' delight. BBC Radio 5 live's David Law tweeting from Flushing Meadows: "Andre Agassi just came out of a press conference and gave James Blake (who was on his way in) a hug. 'You looked on it today,' said AA." 0126: Vera Dushevina gets some serving practice in as Venus is attended to by the medic. 0121: Venus Williams has called for the trainer after three games and gets some attention to her left knee. Not good news, obviously. The sound of Rob Thomas and Carlos Santana (thanks anon, 0100 BST) soothes the crowd. 0118: Venus has made a woeful start and is on the verge of going a double-break down before coming up with an ace at break point. Crisis over? Probably. 0112: Yikes. Venus makes two double-faults and then belts an absolute sitter way over the baseline to drop serve straight away. Stepanek is a set and a break up on Bolelli, while Shaughnessy now leads Hantuchova with a break in their second set. 0106: The knock-up continues. Venus is ranked third and Vera 47th. They've met twice before with the American wining both in straight sets, although they were both in 2004. Venus has gone for bright pink today and Vera the more sober dark blue. 0100: "Piers, Rob Thomas is probably better known as lead singer of Matchbox Twenty. Or as the guy who sang on the Carlos Santana track, 'Smooth'." ca7randall on Twitter: "Any chance you could get them to hurry things along on Arthur Ashe, Piers? I'm struggling with increasing boredom here!!" 0057: Daniela Hantuchova is not hanging around on Louis Armstrong and leads Meghann Shaughnessy by a set and 2-1, while Venus and Dushevina finally emerge onto Arthur Ashe Stadium. BBC Radio 5 live's David Law tweeting from Flushing Meadows: "Agassi on court talking to 20,000 about his foundation and school. He looks in fantastic shape and is bristling with pride. Rightly so." 0035: It's all go on Ashe, we now have a cheery ex-American footballer, whose name I missed, enormous ex-basketballer David Robinson, ex-footballer Mia Hamm (winner of "two World Cup titles"), and ex-tennis superstar and all round top man, Andre Agassi. And they are all missing Radek Stepanek take on Simone Bolelli on Court Four - they'll be livid. BBC Radio 5 live's Steve Rudge tweeting from Flushing Meadows: "'The real Love Train is the Number 7, the fastest and cheapest way of making it to Flushing!' says the gushing Michael Bloomberg... oh dear." 0022: New York mayor Michael Bloomberg is next up, sounding a bit like Mr Burns from The Simpsons, before members of the US armed forces and then the USTA president makes a speech. And this is day one, imagine what the preamble will be like for the final. 0018: The stadium announcer on Ashe goes through a booming countdown before The O'Jays belt out Love Train on court. Odd, but why not? I would hope that that the 5 live boys are dancing along in formation in their commentary box. Meanwhile, Daniela Hantuchova and Meghann Shaughnessy begin their late match on Louis Armstrong. 0009: That's it, Kirsten Flipkens, sporting a mean pair of wraparound shades, sees off Jelena Dokic 6-3 6-4 . 0005: OK, so today is over and it's now officially tomorrow, meaning it's time for the night session in New York. Venus is up first against Vera Dushevina before Roddick takes on Bjorn Phau, who really should have an exclamation mark at the end of his surname, and the Arthur Ashe Stadium is steadily filling up for the night's action. We still have seven matches going on around the outside courts, with Jelena Dokic in trouble against Kirsten Flipkens on 11. BBC Radio 5 live's Jonathan Overend tweeting from Flushing Meadows: "All over out in the sticks. 6-1 MDB. Johansson not impressed at the net. Not the first won't be the last. OK burger time.."
2354: Aussie battler Lleyton Hewitt makes a great start to the tournament with a 6-0 6-3 6-4 win over Thiago Alves of Brazil, and James Blake serves out the match at the second time of asking to beat Ruben Ramirez Hidalgo 6-1 6-4 7-5. BBC Radio 5 live's Jonathan Overend tweeting from Flushing Meadows: "De Brito 1 set all with Johanson. Still screaming. Enric Molina in the chair so experience there - if he wishes to get involved." 2339: Evening all. What a ridiculous time to start work. Still, at least I don't have to run around. We've got Venus and Andy Roddick coming up after midnight (UK time) but there are still plenty of players toiling away into the New York evening, with James Blake and Lleyton Hewitt both closing in on round two. Do manually refresh if you wish to see my name at the top of the page. If you don't... don't. 2329: And that is just about all from me today. Thanks for your company over the last seven-and-a-bit hours, hope you enjoyed them as much as I did. Don't go anywhere yet, though, as Piers is here to take you through to the end of the first day of play at Flushing Meadows, with Andy Roddick and Venus Williams both in action. If you can't sleep then there is no better place to be than right here. 2325: Eighteen-year-old American wildcard Devin Britton (the world number 1,370) after his first-round US Open defeat by top seed and five-time champion Roger Federer: "He obviously looks unbelievable on TV, but playing against him was even more tough. It was so scary. I was pretty scared." 2318: What's this? Another bagel? Yep, 23rd seed Philipp Kohlschreiber took Italy's Andreas Seppi to the cleaners in the first set of their first-round match, clinching it 6-0. The second set is a lot closer, though, and is currently level at 4-4. Lleyton Hewitt is now 4-0 up in the third set against Thiago Alves and just two games from victory. James Blake and Ruben Ramirez Hidalgo are with serve at 1-2 in the third set. Kim Clijsters on Twitter: "Very happy with my US Open start - Arthur Ashe Stadium is the best... I play Marion Bartoli on Wednesday. The good thing about playing first is you get to enjoy the free afternoon, following my exercises and media, I can't wait to see (her daughter) Jada again." 2310: Phew. Blake had to work pretty hard before eventually closing out that second set, but he now leads Ruben Ramirez Hidalgo 6-1 6-4. Lleyton Hewitt? He survived that fightback from Thiago Alves to take the second set 6-3 and is already a break up in the third set too. 2305: On Louis Armstrong Court, Caroline Wozniacki, Tomas Berdych, Jelena Jankovic and Ana Ivanovic are all in action and, on Grandstand Court, Jo-Wilfried Tsonga and Elena Dementieva are among the players who will feature. Lots going on then, but Rafa Nadal will have to wait until day three before he plays Richard Gasquet. 2259: It's what you've all been waiting for... yep, more details of the order of play for day two. Hopefully you know by now about Andy Murray playing Ernests Gulbis in the second night match (in the early hours of Wednesday morning after Maria Sharapova takes on Tsvetana Pironkova) - if not, you do now. Before that, on Arthur Ashe Court, two-time runner-up Svetlana Kuznetsova plays Julia Goerges, followed by top seed Dinara Safina against Olivia Rogowska and 2007 runner-up Novak Djokovic against Ivan Ljubicic. 2254: Lleyton Hewitt has been tearing through his match with Thiago Alves at a fierce pace and led 6-0 5-1 before the Brazilian finally responded by breaking back - you'd still have to fancy the Australian in that one though. On Louis Armstrong Court, James Blake is finding the going a little tougher in the second set against Ruben Ramirez Hidalgo and is level at 4-4. Blake took the first set 6-1. 2247: Yep, Tommy Haas has not produced anything like his best form but still does enough to beat Alejandro Falla 7-5 4-6 7-6 (9-7) 6-3 in three hours and 10 minutes. It felt like at least an hour of that was taken up by toilet breaks and medical time-outs by Falla but, after all his injury problems, Haas will probably be used to facing delays. Next up for the 20th seed is America's Robert Kendrick, who beat Argentina's Martin Vassallo Arguello 6-3 6-2 6-2. 2234: A couple more women's seeds are in action at the moment - Anabel Medina Garrigues of Spain (seeded 20th) is a set up against America's Gail Brodsky and level at 4-4 in the second set. And Russia's Elena Vesnina (seeded 31st) is 3-1 up against Lucie Hradecka of the Czech Republic. By the way, if you are in the New York area and are being disturbed by a loud screeching sound, it's probably because Michelle Larcher De Brito is out on Court 16, against France's Mathilde Johansson. De Brito is in trouble, mind, after losing the first set 6-1 but don't expect her to go down quietly. 2230: Alejandro Falla is having another medical time-out, and the problem seems to be with his left leg - cramp I think. But he had to wait for the doctor, and there's been a delay of about 10 minutes now. Understandably, Tommy Haas is not a happy bunny - he wants to get on with this match and see it out. 2226: Lleyton Hewitt is also well on top against Thiago Alves, running away with the first set without dropping a game. Yep, it's bagel-time again. 2222: James Blake is still flying against Ruben Ramirez Hidalgo - the 21st seed has won the first set 6-1. Back with the Haas-Falla match and Falla is in big trouble, dropping the first two games of the fourth set and apparently complaining that he now has cramp to go with the blister on his hand (Caroline Cheese would be proud). We should remember that Falla has played three matches in qualifying to reach this stage though, so I won't be too harsh on him. BBC Radio 5 live's Alistair Ekyn tweeting from Flushing Meadows: "Have just interviewed Marsel Ilhan, excited man - moved from Uzbekistan five years ago and hopes to be a big a star like the footballers in Turkey." 2212: Also just out on court is Lleyton Hewitt, the 2001 champion and a runner-up at Flushing Meadows in 2004 (as well as a semi-finalist on three other occasions). The 31st seed is up against Thiago Alves of Brazil and has held serve in the opening game. 2205: Yep, despite Christophe's earlier defeat, at least one Rochus brother is into round two after Olivier beat Russia's Igor Kunitsyn 6-3 6-0 6-2 - a result I uncannily 'predicted' while incorrectly writing the score last time I mentioned that match at 2126 (I've changed it now). Olivier will play James Blake or Ruben Ramirez Hidalgo next - that match has just started on Louis Armstrong Court and Blake is 3-0 up after an early break. No predictions from me on that one though, well not intentionally anyway. 2202: Tommy Haas's match with Alejandro Falla is still in the balance - Falla served for the third set at 5-4 but failed miserably...now he is serving to stay in it at 5-6. It also appears that Haas might need a trainer next too - not sure whether he is also suffering from blisters but we will find out soon enough. BBC Radio 5 live's Steve Rudge tweeting from Flushing Meadows: "Andy Murray vs Ernests Gulbis will be on 5 live in the early hours of Wednesday - approx 0230 BST. Right now, 'New York, New York' is on the stadium speakers. Original!" 2153: Er, that 'comeback' by Nuria Llagostera Vives didn't last long. From 3-3 in the second set, she won only one more game and went out 6-0 6-4 to seventh seed Vera Zvonareva of Russia. The seventh seed plays either Yurika Sema or Anna Chakvetadze of Russia next - Sema took the first set of that match 6-4. BBC Radio 5 live's Jonathan Overend tweeting from Flushing Meadows: "Out on Court six for a landmark moment in Turkish tennis - qualifier Marsel Ilhan beats Christophe Rochus - the first ever Grand Slam singles win for a Turkish player." 2136: Amelie Mauresmo is through! She served for the match against Tatjana Malek at 5-4 and came back from 15-40 to see it out 6-3 6-4, with a characteristic wobble along the way. The 17th seed will play Canada's Aleksandra Wozniak next. Wozniak beat Laura Granville 6-1 7-6 (9-7) in her first-round match. 2132: After losing the first set 6-0, Spain's Nuria Llagostera Vives is making more of a game of it against Vera Zvonareva in the second set, which is currently with serve at 3-3. And, on Court 11, Alejandro Falla is back from his extended toilet break and is a break up at 3-1 in the third set against 20th seed Tommy Haas. 2126: It's not all bad news for the Rochus family tonight though. Christophe's younger brother Olivier looks set to make it to the second round as he leads Russia's Igor Kunitsyn 6-3 6-0 3-2. Amelie Mauresmo is almost through too - she leads Tatjana Malek 6-3 5-3. 2122: I'm still waiting for more news on tomorrow's order of play - the only thing I know at the moment is that Andy Murray will follow Maria Sharapova as the second night match, meaning he will play Ernests Gulbis in the early hours of Wednesday morning. Here's another result for you too - the world number 221, Marsel Ilhan of Turkey, who is playing in the main draw of the US Open for the first time, has battled past Belgium's Christope Rochus 3-6 6-3 3-6 7-5 7-5. 2115: It's game-on over on Court 11, where Alejandro Falla has taken the second set 6-4 against 20th seed Tommy Haas to level the match at a set-all. The Colombian has just disappeared through the crowd for a toilet break, and nobody seems to know where the nearest toilet actually is. He could be a while then. 2113: Defending champion Roger Federer after starting his bid for a sixth-successive US Open title with a 6-1 6-3 7-5 win over Devin Britton, the world number 1,370: "It was difficult. I didn't know anything of my opponent, or what his technique was. I played well in the beginning but I struggled after that. I was down a break in the second and third. It was tricky but I'm just glad I got through." 2107: It's bagel-time on Grandstand Court, where Vera Zvonareva has taken the first set 6-0 against Nuria Llagostera Vives in just 17 minutes. There is some good news for the Spaniard though - she held serve to take the first game of the second set... is a comeback on the cards? 2101: There's no way back for Glatch now. Some more punishing groundstrokes take Serena Williams to match-point and a big forehand down the line is enough to put the defending champion into the second round with a 6-4 6-1 win. Easy-peasy for the three-time champion. 2058: Serena Williams seems to have put some of her earlier inconsistency behind her and is closing in on victory over Alexa Glatch. The defending champion puts away a potentially tricky backhand from close to the net and leads 6-4 5-1. She has won the last five games and a place in round two looks very close now. 2052: Blimey, I look away for two minutes and Mauresmo wins three games in a row to take the first set 6-3. Meanwhile, seventh seed Vera Zvonareva has started like a train against Spain's Nuria Llagostera Vives, breaking twice to open up a 3-0 lead. 2046: Serena is a break up at the start of the second set too, leading 3-1. Meanwhile, over on Louis Armstrong Court, Amelie Mauresmo has just started her first-round match with Tatjana Malek, which is going with serve in the first set. Mauresmo has lost in the last eight at Flushing Meadows four times and has been beaten in the semi-finals twice so she certainly has a decent record in New York. More worryingly for the veteran French star, she hasn't been past the fourth round at a Grand Slam since she reached the last four here in 2006. Can she put that right this year? 2042: Just a reminder of tonight's late matches, that begin at 0000 BST. Venus Williams, the 1999 women's champion, takes on Russia's Vera Dushevina before Andy Roddick, who clinched the men's title in 2003, takes on Germany's Bjorn Phau. 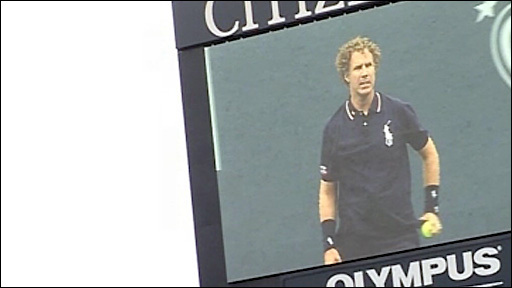 2037: Tommy Haas, three times a quarter-finalist at Flushing Meadows and a semi-finalist at Wimbledon earlier this year, is out on Court 11 against Colombia's Alejandro Falla. Haas, the 20th seed, has made a good start too - taking the first set 7-5, and he is already a break up in the second set, leading 2-0. 2031: Back to the Arthur Ashe Court, where Serena Williams is back on track against Alexa Glatch. Serving for the first set for the second time, she moves 40-0 up and clinches it 6-4 with an ace, her fourth of the match. 2024: Oooh. I told you earlier that Serena Williams was making mistakes and, erm, she still is. Leading 5-2 and serving for the first set, she loses a bit of focus and finds herself facing two break-points. Serena saves one, but Glatch attacks a weak(ish) second serve on the next point and cleans up - she's still a break down, mind, but at least she is alive and kicking. 2021: More Fed news. The defending champion will play Simon Greul in round two after the German, the world number 65, beat Ecuador's Giovanni Lapentti 6-3 4-6 3-6 6-0 7-6 (11-9). A bit of a marathon, that one. 2018: Another men's seed has tumbled out, with John Isner beating Romania's Victor Hanescu, seeded 28th, in straight sets - including that marathon tie-break. The American won 6-1 7-6 (16-14) 7-6 (7-5) and will play Christophe Rochus or Marsel Ilhan in round two - that one has just gone into a fifth set. 2015: Serena breaks again, with a huge backhand winner, and she is now 4-1 - and two breaks up - on the world number 103. 2010: Back on the Arthur Ashe Court and Alexa Glatch is off the mark against Serena, but the defending champion is still a break up in the first set, leading 3-1. Both players are making plenty of mistakes right now, and they are both wearing 'hot pink' outfits too. Those two things are probably not connected to be honest. 2005: It was a bit of a struggle at times but Spain's Tommy Robredo has come through his first-round match with America's Donald Young. The 14th seed won 6-4 3-6 6-2 6-3. 2002: Not a great start for Alexa Glatch against Serena Williams on the Arthur Ashe Court. Her first double fault sees her broken in the very first game. From BulletMonkey on 606: "A good opening win for Roger Federer, but Devin Britton looks like he could be pretty handy in a few years. Keep an eye on him..."
1956: Sounds like an extraordinary second set tie-break over on Louis Armstrong Court, where America's John Isner triumphed 16-14 to move two sets up against 28th seed Victor Hanescu - it's just a shame I didn't see a single point of it. They are just about to have another tie-break in the third set so I'll get back to you in an hour or so when they've finished and let you know how they got on. 1952: We've just seen the defending men's champion strut his stuff - now it's Serena Williams' turn. Like Federer, she is up against an American wildcard - Alexa Glatch, who has not won a match on hard-courts this season. Doesn't bode too well, does it? 1949: Continuing our catch-up of results, eighth seed Nikolay Davydenko is through to round two after beating Dieter Kindlmann 6-3 6-4 7-5. Marco Chiudinelli saw off Potito Starace 7-6 (7-3) 7-6 (7-2) 6-0 and Robin Soderling, the 12th seed, eventually beat Spain's Albert Montanes 6-1 3-6 6-1 6-4. 1945: While Rog was finishing off Britton, we've had a flurry of bagel activity... Marion Bartoli set up a second-round clash with Kim Clijsters with a convincing 6-1 6-0 win over Rossana De Los Rios and 10th seed Flavia Pennetta has just taken the first set 6-0 against Romania's Edina Gallovits. Britton's serve has kept him in this third set but it lets him down on this occasion - a double-fault costing him dear when he is advantage up. Roger Federer is in at the net to put away the next point and passes the American with a crosscourt forehand to seal his victory. He got a decent work-out too. Next up for the champion is Giovanni Lapentti or Simon Greul. From clairefedererfan on 606: "Federer is cruising through in first or second gear, nowhere near top gear. Pops himself into third to get back on serve every so often." Only one hiccup here for Federer - a drop-shot attempt that falls just the wrong side of the net. Four big serves mean he still holds with comfortably, and the pressure switches back to Britton. A couple more booming serves, both to the Federer forehand, and a precise backhand winner into the corner put Britton 40-0 up and make you feel as though he is a champion in the making. As we've seen in the last hour-and-a-half or so, it doesn't last. Fed perseveres and claws his way back to deuce and it takes some brave serve-volleying from Britton to hold. For a moment there, it looked like we were near the end. A double-fault by Federer, his third of the match, gets him off to a bad start but Britton seems to have lost the plot a bit, and at such a crucial time too. His forehand is now wild rather than inspired and more mistakes mean Fed does not have to work hard to hold - Britton will serve to stay in the match next, he needs to pull himself together and fast. Erm, no. At 30-all, Britton is actually looking good but a sloppy forehand volley flies long and, on the next point, he mis-hits a forehand that loops horribly out. That was a chance, but he wasted it - will he get another one? We're back with serve in this third set. Crikey, I didn't see that coming! Britton again attacks the Fed serve and it pays off, forcing the Swiss star on the back foot and into a series of mistakes - culminating in a backhand into the net that means Britton is a break up in this third set. Now, can he hold himself this time? Britton is not just a one-trick serving pony - he can mix them up to good effect, and when Fed appears to get the measure of things on his forehand, he switches to a kick-serve to the champion's backhand. It works, and he holds to love. Impressive stuff from last year's junior US Open runner-up. Another solid service game from Federer, who backs up some big deliveries with some strong shots from the back of the court. Too good for Britton. Credit to Britton - he is still serving, and volleying, well too. He holds and is still level in this third set. For now. Tommy Robredo, seeded 14th, has just lost the second set 6-4 to America's Donald Young - that match is level at one-set apiece. And eighth seed Nikolay Davydenko has broken back against Dieter Kindlmann to ensure the third set is now going with serve at 4-4. Over on Court 11, Robin Soderling looks on course for victory over Albert Montanes after going a break up in the fourth set - he leads 6-1 3-6 6-1 5-3. The top seed is still serving like a dream and Britton can do nothing to stop it. The American is still trying those big returns, but they stopped working around the middle of the second set. Britton occasionally looks unbeatable at the net but throw in a couple of low shots and you can see why he still has a lot of improving to do - if he has to stoop for anything he invariably makes an error. Having said all that, he keeps coming in and gets his reward - he is off the mark in the third set and that darned bagel graphic has still not got an outing. News of a first defeat for a men's seed. Paul-Henri Mathieu, seeded 26th, has lost 2-6 7-5 6-0 6-2 to Russia's Mikhail Youzhny. Federer's serve has been smooth as you like today - the one game he has dropped was more to do with Britton's superb returning than any drop in standard by the champion - and he is untroubled again here, bossing things from the back of the court. Britton is fighting on (the battle of Britton?) but a double fault when he is advantage up does not help his cause. Two stinging returns by Federer are too hot for the American to handle and the Swiss star is quickly two sets up - that second set took him 29 minutes. On the plus side for Britton, he did at least win a point following a run of 12 in a row for Federer. He didn't manage a sniff of a break, though, and the champ will fancy his chances of closing this set out in the next game. Hmmm, Britton (or Little Britton as some of you have christened him on 606 despite him being 6ft 3in) is still going backwards and he cannot win a point, let alone a game, at the moment. He is broken to love and Fed is in control of this second set. By the way, Slammin' Sam came good in the end - Sam Stosur, seeded 15th, battled her way into round two with a 6-4 4-6 6-4 victory over Ai Sugiyama of Japan. Lots of mistakes from both players, especially on serve - Stosur converted seven of 13 break points and Sugiyama six of 16. But it was Stosur who prevailed to set up a second-round meeting with unseeded American Vania King. More news from around the courts. We could be about to see our first seed to fall on the men's side of the draw. Paul-Henri Mathieu, trailing by two sets to one against Mikhail Youzhny, is a break down in the fourth set and trails 2-3. Elsewhere, Spanish 14th seed Tommy Robredo has taken the first set against unseeded American Donald Young and Nikolay Davydenko is now two sets up against Dieter Kindlmann but 3-0 down in the third set. Ah, that didn't last long did it? Britton follows up the best game of his life (probably) with one of his worst, capped by a lame half-volley that clips the net and flies into a tramline. We're back with serve in the second set. Er, did I mention Britton's forehand was a weak link!? It seems to have turned into something of a weapon in the space of a few minutes - two huge cross-court winners off the Fed serve help the American break to love. Brilliant stuff. It's fair to say Britton's forehand is his weakest shot but he can still pull out the odd cracker on that flank, and slams down a big winner to seal another impressive service game. Not sure how many points he has won from the back of the court - it hasn't been many - but maybe this is a sign of things to come? Breaking Federer is not quite so easy though - and the champion again holds to love. He has won 89% of points off his first serve, and 80% on his second. Compare that to Britton (50% and 44%) and you can see why this game is going in only one direction. Elsewhere in the men's first round, French Open finalist Robin Soderling, seeded 12th, has just seen unseeded Spaniard Albert Montanes level their match at one-set all. Mikhail Youzhny has continued his comeback against Paul-Henri Mathieu to lead 2-6 7-5 6-0 3-1 and John Isner took the first set 6-1 against 28th seed Victor Hanescu. A sloppy bit of serve-volley from Federer sees him waste his first set point at 40-0 but it doesn't really matter as Britton's forehand is making more mistakes than I did in my GCSE maths exam - he sees his next return fly out and Fed is a set up in just 18 minutes. Oh dear. At 30-all, Britton is in with a sniff of another hold but he goes downhill fast from there. A wild volley sails long before another poor forehand flies a mile out. Fed will serve for the first set next. From sean2mush on 606: "Come on Britton, do it for the Queen!" A couple of crashing serves by Britton give him a fighting chance at 30-love and it is clear he needs to put Fed on the back foot with that kind of delivery if he is to stand a chance here - Fed reaches his next three serves and wins every point. It's not looking good for the teenager but two more aces dig him out of a hole and suddenly he is on the scoreboard against the five-time champion. Well done. BBC Radio 5 live's Alistair Eykyn's tweeting from Flushing Meadows: "Viktoriya Kutusova walloped by Kim Clijsters then not even given an interview room afterwards... left in a corridor looking lonely for the press." Poor Devin just cannot compete from the back of the court - Federer is able to move him around at will and either find a winner or force the mistake and he holds to love, again. Just one point dropped by the champion in the first three games. Britton, who loves to serve and volley, gets off the mark by doing just that with the first point but that is as good as it gets for the American. Federer quickly realises that he can boss this from the back of the court and draws errors out of his opponent to take the next four points with relative ease. This looks ominous, and I fear that bagel graphic might be appearing quite soon. Um, not a bad start for the defending champ. Fed kicks off with an ace and does not drop a point as he holds to love. 1810: Roger Federer will serve and get his bid for a sixth successive US Open title under way. 1801: Here comes Fed, strolling out on to the Arthur Ashe Court and looking pretty cool in a red and black tracksuit - much better than that cardigan. He's up against American teenager Devin Britton, who is the world number 1,370 and deserves a 'Britton Up' graphic just for sharing the same court as the great man. 1758: It appears our 'latest score' feed is not working, which is a bit of a blow. I will, however, try to keep you updated on as many matches as I can in the next few minutes/hours/days while our techies try to get it fixed. I'll start with Marco Chiudinelli of Switzerland, who is two sets up against Potito 'Don't call me Potato' Starace of Italy on Court Eight after taking two tie-breaks 7-3 and 7-2. 1754: 2005 champion Kim Clijsters, in her first Grand Slam for two years, on her 6-1 6-1 win over Viktoriya Kutuzova: "It was nice to come out here on centre court and open the tournament, as I didn't get to do so as defending champion a few years ago. I'm glad I won in two sets without wasting too much energy. I had a few butterflies, more than I normally do." 1748: More news from around the courts while we wait for Roger Federer to emerge (at 1800 BST). Another Russian, eighth seed Nikolay Davydenko, has taken the first set 6-3 against Germany's Dieter Kindlmann on Court Four. Over on Louis Armstrong, 28th seed Victor Hanescu is 4-1 down against America's John Isner and, on Court Seven, 14th seed Tommy Robredo is 2-0 up against another home player, Donald Young. 1744: Mikhail Youzhny is fighting back agains Paul-Henri Mathieu. The Russian, who was ranked eighth in the world at the start of 2008 but is now down at number 60, lost the first set 6-2 but has just taken the second set 7-5 to level the match. From Marianna in York, via text on 81111: "My heart is already in knots for Federer to make it six - this kind of loyalty is exhausting. Come on Rog!" 1736: BBC Radio 5 live's Jonathan Overend at Flushing Meadows: Kim Clijsters played some lovely stuff - although Viktoriya Kutuzova was slow and unpredictable at the start of their match, she improved but Kim was just too strong for her. Victoria Azarenka, who Clijsters could potentially play in the quarter-finals, was also impressive against Alexandra Dulgheru, especially with her brutal cross-court backhand. She is going to be a real threat as this tournament progresses. 1730: Victoria Azarenka is another player to ease into the second round, with the eighth seed thumping Alexandra Dulgheru 6-1 6-1. Azarenka will play Marta Domachowska of Poland or the snappily-named Barbora Zahlavova Strycova of the Czech Republic next. While I recover from typing her name out I should tell you that Francesca Schiavone breezed past Yvonne Meusburger too, winning 6-1 6-2. Did I mention Schiavone comes from London...? 1722: Sam Stosur, also known as Slammin' Sam, has been tipped for a decent run at the US Open this year but the Australian is having a bit of a battle with Japan's Ai Sugiyama in her first-round match out on Court 13. The 15th seed took the first set 6-4 but has just had to break back in the second to level the score at 4-4 and has made 33 unforced errors so far. Not quite on top form then. 1717: Oh dear. A limp forehand from Viktoriya Kutuzova flops into the net and Kim Clijsters is through in just 54 minutes with a comprehensive 6-1 6-1 win. That means five-time champion Roger Federer is on court next - his match with wildcard Devin Britton, the world number 1,370, will start at 1800 BST. 1713: Clijsters has just broken again, then swiftly holds to love (for the fifth time today) to lead 6-1 5-1. She is looking very good for a place in round two, where she will meet French 14th seed Marion Bartoli or Paraguay's Rossana De Los Rios. Clijsters beat Bartoli in her comeback match, in Cincinnati, so playing a seed will hold no fears for the Belgian, who as yet does not hold a world ranking.